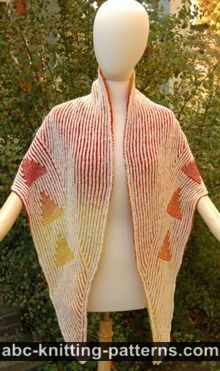 The Brioche motif down the middle of this stole looks like grains on a sheaf of barley or wheat, hence the name Sheaves of Barley Stole. 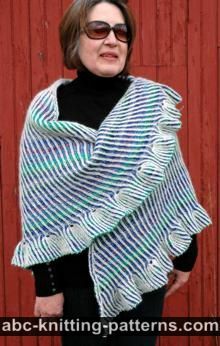 This is a long and wide stole, and the double-knitting of the brioche makes it quite thick. 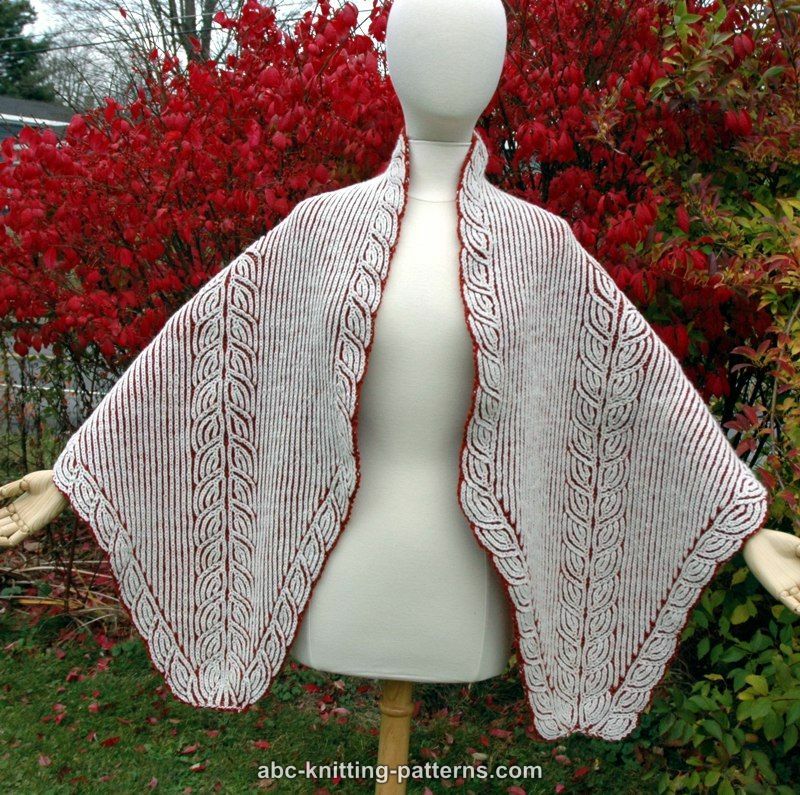 It's great for cold weather. 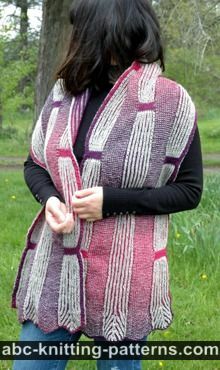 As all brioche, this stole is double-sided, but I personally liked the appearance of the lighter side better. 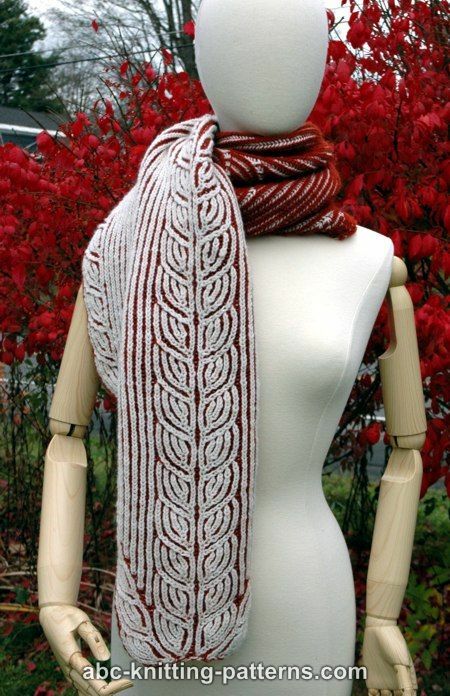 The stole is worked in 2-color brioche st from one end to the other. It starts from the pointy end. 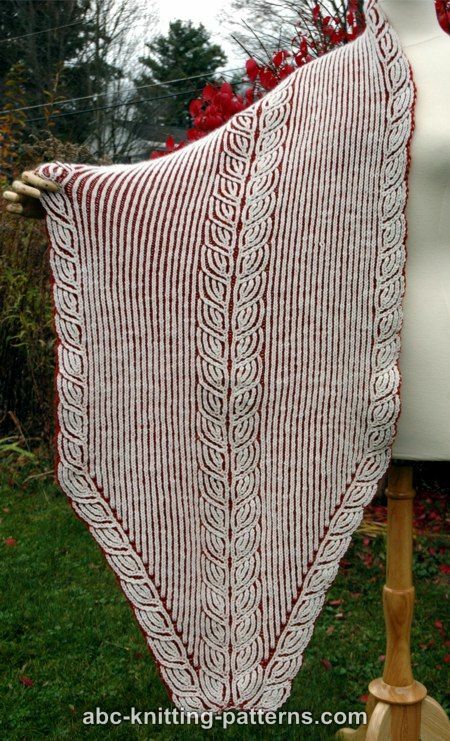 The increases are made on the wrong side of the stole inside of the Barley pattern (Right or Left). 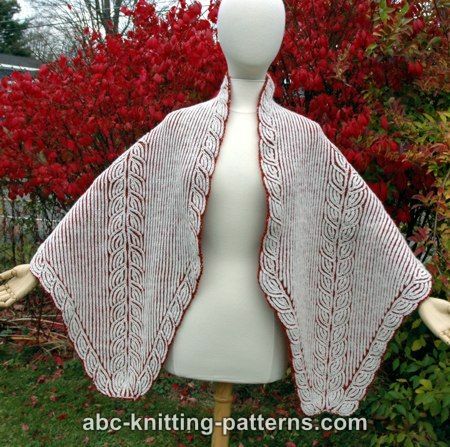 After the main part is worked, the creases are made in the same way to form another pointy end. 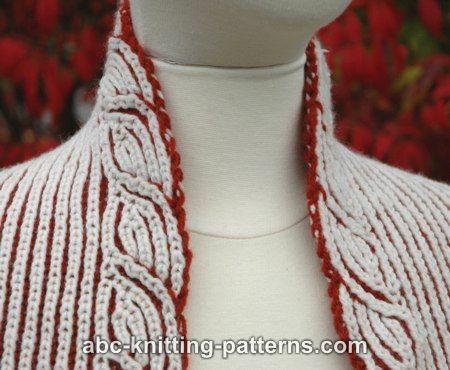 To knit this stole, you have to know how to knit 2-color brioche stitch. Worked at the beginning and the end of the row, consists of 1 st.
Row 1 (LS LC): Beginning of the row: bring LC under DC, sl 1; end of the row: p 1. Do not turn, slide work to the other end of the needle. Row 1 (LS DC): Beginning of the row: sl 1, end of the row: p 1. Turn. Row 2 (DS LC): of the row: bring LC under DC, sl 1; end of the row: p 1. Do not turn, slide work to the other end of the needle. Row 2 (DS DC): Beginning of the row: sl 1, end of the row: p 1. Turn. On 10 sts. Note, that the number of sts from Row 1-9 becomes 12 and then is reversed back to 10 in rows 9-10. Row 1 (LS, LC): (brk, yf sl1yo) 4 times, brkyobrk, yf sl1yo. 12 sts. Row 1 (LS, DC): (yf sl1yo, brp) 4 times, yf sl1yo, p1, yf sl1yo, brp. Row 2 (DS, LC): (yf sl1yo, brp) 6 times. Row 2 (DS, DC): (brk, yf sl1yo) 6 times. Row 3 (LS, LC): (brk, yf sl1yo) 3 times, brk2tog, yf sl1yo, brkyobrk, yf sl1yo. Row 3 (LS, DC): repeat row 1. Row 4 (DS, LC): repeat row 2. Row 4 (DS, DC): repeat row 2. Row 5 (LS, LC): (brk, yf sl1yo) 2 times, brk2tog, yf sl1yo, brkyobrk, yf sl1yo, brk, yf sl1yo. Row 5 (LS, DC): (yf sl1yo, brp) 3 times, yf sl1yo, p1, (yf sl1yo, brp) 2 times. Row 6 (DS, LC): repeat row 2. Row 6 (DS, DC): repeat row 2. Row 7 (LS, LC): brk, yf sl1yo, brk2tog, yf sl1yo, brk, yf sl1yo, brkyobrk, yf sl1yo, brk, yf sl1yo. Row 7 (LS, DC): repeat row 5. Row 8 (DS, LC): repeat row 2. Row 8 (DS, DC): repeat row 2. Row 9 (LS, LC): brk2tog, (yf sl1yo, brk) 4 times, yf sl1yo. 10 sts. Row 9 (LS, DC): (yf sl1yo, brp) 5 times. Row 10 (DS, LC): (brk, yf sl1yo) 5 times. Row 10 (DS, DC): (yf sl1yo, brp) 5 times. On 9 sts. Note, that the number of sts from Row 1-9 becomes 11 and then is reversed back to 9 in rows 9-10. Row 1 (LS, LC): brkyobrk, (yf sl1yo, brk) 4 times. 11 sts. Row 1 (LS, DC): yf sl1yo, p1, (yf sl1yo, brp) 4 times, yf sl1yo. Row 2 (DS, LC): (brp, yf sl1yo) 5 times, brp. Row 2 (DS, DC): (yf sl1yo, brk) 5 times, yf sl1yo. Row 3 (LS, LC): brkyobrk, yf sl1yo, brsssk, (yf sl1yo, brk) 3 times. Row 5 (LS, LC): brk, yf sl1yo, brkyobrk, yf sl1yo, brsssk, (yf sl1yo, brk) 2 times. Row 5 (LS, DC): yf sl1yo, brp, yf sl1yo, p1, (yf sl1yo, brp) 3 times, yf sl1yo. Row 7 (LS, LC): brk, yf sl1yo, brkyobrk, yf sl1yo, brk, yf sl1yo, brsssk, yf sl1yo, brk. Row 9 (LS, LC): (brk, yf sl1yo) 4 times, brsssk. 9 sts. Row 9 (LS, DC): (yf sl1yo, brp) 4 times, yf sl1yo. Row 10 (DS, LC): (brp, yf sl1yo) 4 times, brp. Row 10 (DS, DC): (yf sl1yo, brk) 4 times, yf sl1yo. This is a combination of the Right and Left Barley patterns. On 20 sts. 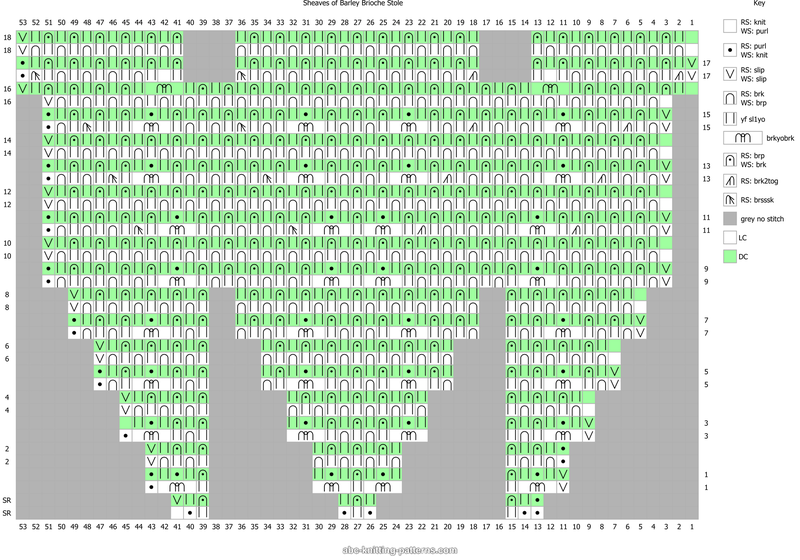 Note, that the number of sts from Row 1-9 becomes 24 and then is reversed back to 20 in rows 9-10. Row 1 (LS, LC): (brk, yf sl1yo) 4 times, brkyobrk, yf sl1yo, brkyobrk, (yf sl1yo, brk) 4 times, yf sl1yo. 24 sts. Row 1 (LS, DC): (yf sl1yo, brp) 4 times, yf sl1yo, p1, yf sl1yo, brp, yf sl1yo, p1, (yf sl1yo, brp) 5 times. Row 2 (DS, LC): (yf sl1yo, brp) 12 times. Row 2 (DS, DC): (brk, yf sl1yo) 12 times. Row 3 (LS, LC): (brk, yf sl1yo) 3 times, brk2tog, (yf sl1yo, brkyobrk) 2 times, yf sl1yo, brsssk, (yf sl1yo, brk) 3 times, yf sl1yo. Row 5 (LS, LC): (brk, yf sl1yo) 2 times, brk2tog, yf sl1yo, brkyobrk, (yf sl1yo, brk) 2 times, yf sl1yo, brkyobrk, yf sl1yo, brsssk, (yf sl1yo, brk) 2 times, yf sl1yo. Row 5 (LS, DC): ((yf sl1yo, brp) 3 times, yf sl1yo, p1) 2 times, (yf sl1yo, brp) 4 times. Row 7 (LS, LC): brk, yf sl1yo, brk2tog, (yf sl1yo, brk, yf sl1yo, brkyobrk, yf sl1yo, brk) 2 times, yf sl1yo, brsssk, yf sl1yo, brk, yf sl1yo. Row 9 (LS, LC): brk2tog, (yf sl1yo, brk) 8 times, yf sl1yo, brsssk, yf sl1yo. 20 sts. Row 9 (LS, DC): (yf sl1yo, brp) 10 times. Row 10 (DS, LC): (brk, yf sl1yo) 10 times. Row 10 (DS, DC): (yf sl1yo, brp) 10 times. 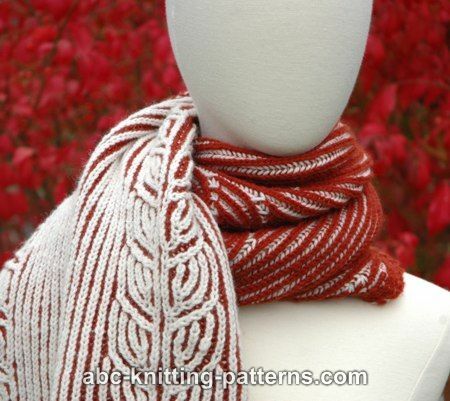 Using 2 strands of yarn (LC and DC), cast on 9 sts. Set-up Row (DS, LC): p1, (k1, yf sl1yo) 3 times, k2. 9 sts. Set-up Row (DS, DC): sl, (yf sl1yo, brk) 3 times, yf sl1yo, k1. Row 1 (LS, LC): sl, (brkyobrk, yf sl1yo) 3 times, brkyobrk, p1. 17 sts. Row 1 (LS, DC): sl, (yf sl1yo, p1, yf sl1yo, brp) 3 times, (yf sl1yo, p1) 2 times. Row 2 (DS, LC): sl, (brp, yf sl1yo) 7 times, brp, k1. Row 2 (DS, DC): sl, (yf sl1yo, brk) 7 times, yf sl1yo, k1. Row 3 (LS, LC): sl, brkyobrk, (yf sl1yo, brk, yf sl1yo, brkyobrk, yf sl1yo, brk) 2 times, yf sl1yo, brkyobrk, p1. 25 sts. Row 3 (LS, DC): sl, yf sl1yo, p1, ((yf sl1yo, brp) 2 times, yf sl1yo, p1, yf sl1yo, brp) 2 times, yf sl1yo, brp, yf sl1yo, p1, yf sl1yo, k1. Row 4 (DS, LC): sl, (brp, yf sl1yo) 11 times, brp, p1. Row 4 (DS, DC): sl, (yf sl1yo, brk) 11 times, yf sl1yo, p1. Row 5 (LS, LC): sl, (brk, yf sl1yo, brkyobrk, yf sl1yo, brk, yf sl1yo) 3 times, brk, yf sl1yo, brkyobrk, yf sl1yo, brk, p1. 33 sts. Row 5 (LS, DC): sl, (yf sl1yo, brp, yf sl1yo, p1, (yf sl1yo, brp) 2 times) 3 times, (yf sl1yo, brp, yf sl1yo, p1) 2 times. Row 6 (DS, LC): sl, (brp, yf sl1yo) 15 times, brp, p1. Row 6 (DS, DC): sl, (yf sl1yo, brk) 15 times, yf sl1yo, p1. Row 7 (LS, LC): sl, ((brk, yf sl1yo) 2 times, brkyobrk, (yf sl1yo, brk) 3 times, yf sl1yo, brkyobrk, yf sl1yo) 2 times, brk, yf sl1yo, brk, p1. 41 sts. Row 7 (LS, DC): sl, ((yf sl1yo, brp) 2 times, yf sl1yo, p1, (yf sl1yo, brp) 4 times, yf sl1yo, p1, yf sl1yo, brp) 2 times, yf sl1yo, brp, yf sl1yo, p1. Row 8 (DS, LC): sl, (brp, yf sl1yo) 19 times, brp, p1. Row 8 (DS, DC): sl, (yf sl1yo, brk) 19 times, yf sl1yo, p1. Row 9 (LS, LC): sl, (brk, yf sl1yo) 3 times, brk, (yf sl1yo, brkyobrk, (yf sl1yo, brk) 4 times, yf sl1yo, brkyobrk) 2 times, (yf sl1yo, brk) 4 times, p1. 49 sts. Row 9 (LS, DC): sl, (yf sl1yo, brp) 3 times, (yf sl1yo, brp, yf sl1yo, p1, (yf sl1yo, brp) 5 times, yf sl1yo, p1) 2 times, (yf sl1yo, brp) 4 times, yf sl1yo, p1. Row 10 (DS, LC): sl, (brp, yf sl1yo) 23 times, brp, p1. Row 10 (DS, DC): sl, (yf sl1yo, brk) 23 times, yf sl1yo, p1. 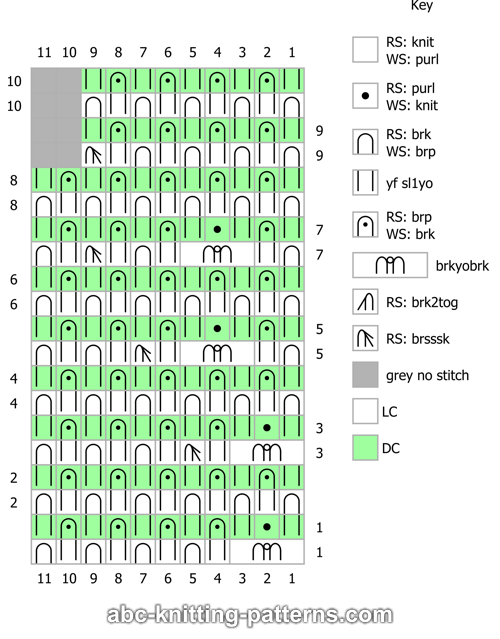 Row 11 (LS, LC): sl, ((brk, yf sl1yo) 3 times, brk2tog, yf sl1yo, brkyobrk, yf sl1yo) 2 times, brkyobrk, yf sl1yo, brsssk, (yf sl1yo, brk) 3 times, yf sl1yo, brkyobrk, yf sl1yo, brsssk, (yf sl1yo, brk) 3 times, p1. Row 11 (LS, DC): repeat row 9. Row 12 (DS, LC): repeat row 10. Row 12 (DS, DC): repeat row 10. 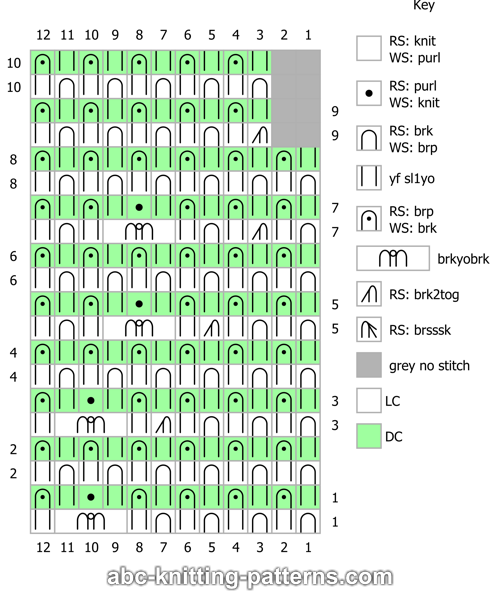 Row 13 (LS, LC): sl, ((brk, yf sl1yo) 2 times, brk2tog, yf sl1yo, brkyobrk, yf sl1yo, brk, yf sl1yo) 2 times, brk, yf sl1yo, brkyobrk, yf sl1yo, brsssk, (yf sl1yo, brk) 3 times, yf sl1yo, brkyobrk, yf sl1yo, brsssk, (yf sl1yo, brk) 2 times, p1. Row 13 (LS, DC): sl, ((yf sl1yo, brp) 3 times, yf sl1yo, p1, (yf sl1yo, brp) 5 times, yf sl1yo, p1) 2 times, (yf sl1yo, brp) 3 times, yf sl1yo, p1. Row 14 (DS, LC): repeat row 10. Row 14 (DS, DC): repeat row 10. Row 15 (LS, LC): sl, (brk, yf sl1yo, brk2tog, yf sl1yo, brk, yf sl1yo, brkyobrk, yf sl1yo, brk, yf sl1yo) 2 times, brk, yf sl1yo, brkyobrk, yf sl1yo, brk, yf sl1yo, brsssk, (yf sl1yo, brk) 2 times, yf sl1yo, brkyobrk, yf sl1yo x 3, brsssk, yf sl1yo, brk, p1. Row 15 (LS, DC): repeat row 13. Row 16 (DS, LC): repeat row 10. Increase row: place marker on the 11th st from the beginning of the row and on the 11th st from the end of the row (counting from the 1st (selvedge st). This is the marked st, where the increases are made. Work brkyobrk at this stitch in every 4th row (16, 20, 24, 28, etc.) Total 18 times. Row 16 (DS, DC): sl, (yf sl1yo, brk) 4 times, yf sl1yo, brkyobrk, (yf sl1yo, brk) 13 times, yf sl1yo, brkyobrk, (yf sl1yo, brk) 4 times, yf sl1yo, p1. 53 sts. Row 17 (LS, LC): sl, brk2tog, (yf sl1yo, brk) 4 times, yf sl1yo, k1, yf sl1yo, brk2tog, (yf sl1yo, brk) 8 times, yf sl1yo, brsssk, yf sl1yo, k1, (yf sl1yo, brk) 4 times, yf sl1yo, brsssk, p1. 45 sts. Row 17 (LS, DC): sl, (yf sl1yo, brp) 21 times, yf sl1yo, p1. Row 18 (DS, LC): sl, (brp, yf sl1yo) 21 times, brp, p1. Row 18 (DS, DC): sl, (yf sl1yo, brk) 21 times, yf sl1yo, p1. 2 st (then 4, 6, 8, ... up to 36 after the last increase) of brioche st. The last increase is row 84. 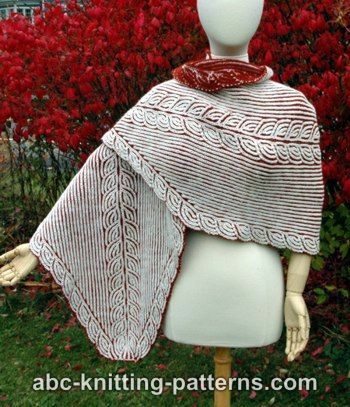 Work 88 rows as established. Short row 1 (LS, LC): bring LC under DC, sl 1, *(brk1, yfsl1yo) 4 times. Since at this point it is not possible to slide work to the other end of the needle, return the stitches to the left needle. Short row 1 (LS, LC): sl 1, *(sl1yof, brp 1) 4 times, w&t. Short row 2 (DS, LC): (sl1yof, brp1) 4 times, return the stitches to the left needle. Short row 2 (DS, DC): (brk1, yfsl1yo) 4 times, p 1. Turn. Short row 3 (LS, LC): bring LC under DC, sl 1, *(brk1, yfsl1yo) 3 times, return the stitches to the left needle. Short row 3 (LS, LC): sl 1, *(sl1yof, brp 1) 3 times, w&t. Short row 4 (DS, LC): (sl1yof, brp1) 3 times, return the stitches to the left needle. Short row 4 (DS, DC): (brk1, yfsl1yo) 3 times, p 1. Turn. Row 89 (LS, LC): bring LC under DC, sl 1, brk2tog , yfsl1yo, (brk1, yfsl1yo) 4 times, (brk1, yfsl1yo) 18 times, brk2tog , yfsl1yo, (brk1, yfsl1yo) 4 times, (brk1, yfsl1yo) 4 times, brsssk, yfsl1yo, (brk1, yfsl1yo) 18 times, (brk1, yfsl1yo) 4 times, brsssk, p 1. DO not turn, slide work to the other end of the needle. Row 89 (LS, LC): *sl1yof, brp1, repeat from * to last 2 sts, end with sl1yof, p 1. Turn. Short row 1 (DS, LC): sl1, (brp1, sl1yof) 4 times, return the stitches to the left needle. Short row 1 (DS, DC): sl 1, (yfsl1yo, brk1) 4 times, w&t. 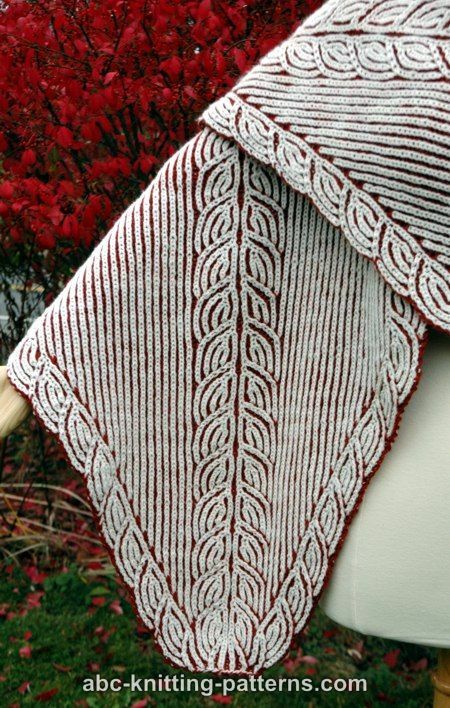 Short row 2 (LS, LC): (yfsl1yo, brk1) 4 times, return the stitches to the left needle. Short row 2 (LS, LC): (brp 1, sl1yof) 4 times, p1. Short row 3 (DS, LC): sl1, (brp1, sl1yof) 3 times, return the stitches to the left needle. Short row 3 (DS, DC): sl 1, (yfsl1yo, brk1) 3 times, w&t. 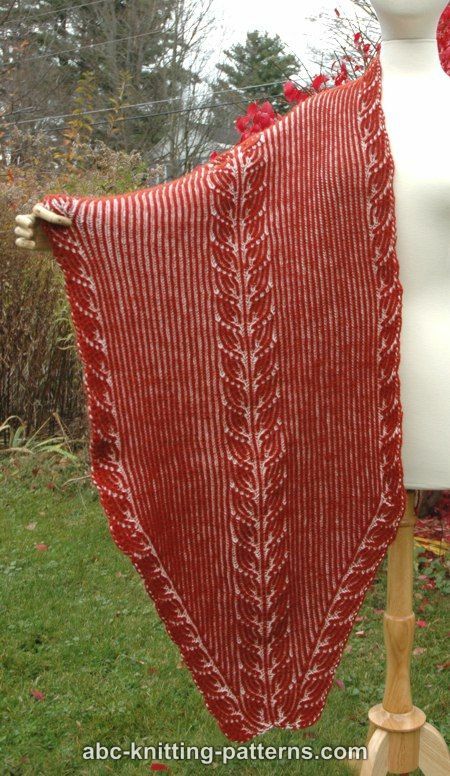 Short row 4 (LS, LC): (yfsl1yo, brk1) 3 times, return the stitches to the left needle. Short row 4 (LS, LC): (brp 1, sl1yof) 3 times, p1. Row 90 (DS, LC): bring LC under DC, sl 1, * brp1, sl1yof, repeat from * to last 2 sts, end with brp1, p1. DO not turn, slide work to the other end of the needle. Row 90 (DS, DC): sl 1, * yfsl1yo, brk1, repeat from * to last 2 sts, end with yfsl1yo, p 1. Turn. 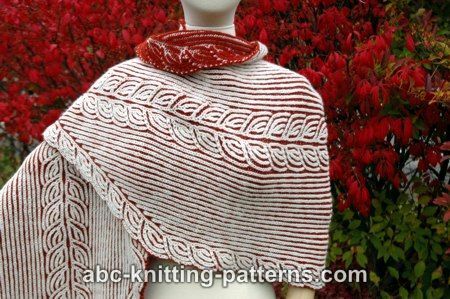 Continue to work as established, working 26 pattern repeats (260 rows) or to desired length, keeping in mind that the pointy end of the stole measures 14” (36 cm). Row 349 (LS, LC): bring LC under DC, sl 1, brk2tog, yfsl1yo, (brk1, yfsl1yo) 4 times, (brk1, yfsl1yo) 18 times, brk2tog , yfsl1yo, (brk1, yfsl1yo) 4 times, (brk1, yfsl1yo) 4 times, brsssk, yfsl1yo, (brk1, yfsl1yo) 18 times, (brk1, yfsl1yo) 4 times, brsssk, p 1. DO not turn, slide work to the other end of the needle. Row 349 (LS, LC): *sl1yof, brp1, repeat from * to last 2 sts, end with sl1yof, p 1. Turn. Row 350 (DS, LC): bring LC under DC, sl 1, * brp1, sl1yof, repeat from * to last 2 sts, end with brp1, p1. DO not turn, slide work to the other end of the needle. Decrease row: work brsssk at the marked st at the beginning of the row and brk2tog at the marked st at the end of the row. Make decreases at these sts in every 4th row (354, 358, 362, etc.) Total 18 times. Row 350 (DS, DC): sl 1, * yfsl1yo, brk1, repeat from * to last 2 sts, end with yfsl1yo, p 1. Turn. Continue to work as established rows 351-418, making decreases at marked sts every 4th row and working Right, Left and Central Barley pattern. Row 419 (LS, LC): sl, (brk, yf sl1yo) 3 times, brk, (yf sl1yo, brkyobrk, (yf sl1yo, brk) 4 times, yf sl1yo, brkyobrk) 2 times, (yf sl1yo, brk) 4 times, p1. 49 sts. Row 419 (LS, DC): sl, (yf sl1yo, brp) 3 times, (yf sl1yo, brp, yf sl1yo, p1, (yf sl1yo, brp) 5 times, yf sl1yo, p1) 2 times, (yf sl1yo, brp) 4 times, yf sl1yo, p1. Row 420 (DS, LC): sl, (brp, yf sl1yo) 23 times, brp, p1. Row 420 (DS, DC): sl, (yf sl1yo, brk) 23 times, yf sl1yo, p1. Row 421 (LS, LC): sl, ((brk, yf sl1yo) 3 times, brk2tog, yf sl1yo, brk, yf sl1yo) 2 times, brk, yf sl1yo, brsssk, (yf sl1yo, brk) 4 times, yf sl1yo, brsssk, (yf sl1yo, brk) 3 times, p1. 41 sts. Row 421 (LS, DC): sl, (yf sl1yo, brp) 19 times, yf sl1yo, p1. Row 422 (DS, LC): sl, (brp, yf sl1yo) 19 times, brp, p1. Row 422 (DS, DC): sl, (yf sl1yo, brk) 19 times, yf sl1yo, p1. Row 423 (LS, LC): sl, ((brk, yf sl1yo) 2 times, brk2tog, yf sl1yo, brk, yf sl1yo) 2 times, brk, yf sl1yo, brsssk, (yf sl1yo, brk) 3 times, yf sl1yo, brsssk, (yf sl1yo, brk) 2 times, p1. 33 sts. Row 423 (LS, DC): sl, (yf sl1yo, brp) 15 times, yf sl1yo, p1. Row 424 (DS, LC): sl, (brp, yf sl1yo) 15 times, brp, p1. Row 424 (DS, DC): sl, (yf sl1yo, brk) 15 times, yf sl1yo, p1. Row 425 (LS, LC): sl, (brk, yf sl1yo, brk2tog, yf sl1yo, brk, yf sl1yo) 2 times, brk, yf sl1yo, brsssk, (yf sl1yo, brk) 2 times, yf sl1yo, brsssk, yf sl1yo, brk, p1. 25 sts. Row 425 (LS, DC): sl, (yf sl1yo, brp) 11 times, yf sl1yo, p1. Row 426 (DS, LC): sl, (brp, yf sl1yo) 11 times, brp, p1. Row 426 (DS, DC): sl, (yf sl1yo, brk) 11 times, yf sl1yo, p1. Row 427 (LS, LC): sl, (brk2tog, yf sl1yo, brk, yf sl1yo) 2 times, brk, yf sl1yo, brsssk, yf sl1yo, brk, yf sl1yo, brsssk, p1. 17 sts. Row 427 (LS, DC): sl, (yf sl1yo, brp) 7 times, yf sl1yo, p1. Row 428 (DS, LC): sl, (brp, yf sl1yo) 7 times, brp, p1. Row 428 (DS, DC): sl, (yf sl1yo, brk) 7 times, yf sl1yo, p1. 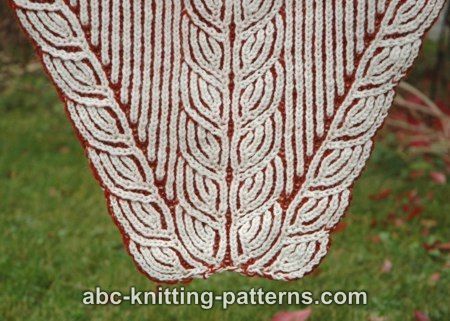 I sure would love to learn this style of knitting ,It is beautiful I just may have to give it a try.Although it looks complicated .